Mooi Naturals lovely and more nourishing clay based scrub cleanses, moisturises, and gently exfoliates the skin, absorbing excess oil and dirt. 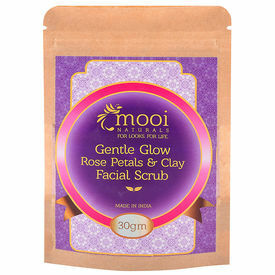 Also brightens your complexion by gently exfoliating away dry, lifeless skin. 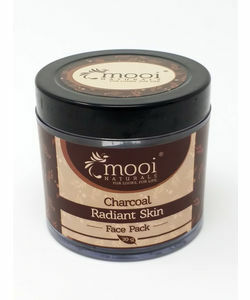 Best suited for all skin types and an ideal blend even for the most sensitive and easily irritated skin. After Cleansing,simply tap out a bit of the powder into the palm of your hand and mix with water to form a paste.Apply generously to face and throat, avoiding the eye area. After 7 to 10 minutes, lightly massage with very wet hands to enhance exfoliation properties during removal.Rinse with warm water and follow with Pure Rose Refreshing Toner and Velvetty Vetiver Moisturizer. Mooi Naturals lovely and more nourishing clay based scrub cleanses, moisturises, and gently exfoliates the skin, absorbing excess oil and dirt. Also brightens your complexion by gently exfoliating away dry, lifeless skin. Best suited for all skin types and an ideal blend even for the most sensitive and easily irritated skin. To Use: After Cleansing,simply tap out a bit of the powder into the palm of your hand and mix with water to form a paste.Apply generously to face and throat, avoiding the eye area. 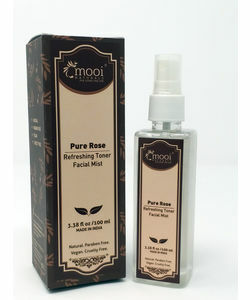 After 7 to 10 minutes, lightly massage with very wet hands to enhance exfoliation properties during removal.Rinse with warm water and follow with Pure Rose Refreshing Toner and Velvetty Vetiver Moisturizer. Disclaimer : Always recommend to do a patch test for compatibility prior to using any new products. All of Mooi Naturals products are vegan and cruelty free and do not contain either synthetic ingredients or ingredients of animal origin. Kaolinite (Rose Clay) Rose clay is a great exfoliant for the skin, it reduces irritation, increases circulation, regenerates collagen, promotes new cell growth for skin, and also regenerates elastin within the skin. Rosa Centifolia (Rose) Petal Powder Roses have an amazing affect on body, mind and skin.The antibacterial properties along with the positive effects of Vitamin K, C and B in rose petals, make them excellent for fighting acne and breakouts. The petals can also soothe irritated skin and reduce its redness.Roses are in rich in antioxidants and gets a radiant and glowing skin. Avena Sativa (Oat) Kernel Flour Oatmeal has great anti-inflammatory properties and is a great natural remedy.It removes excess oil from skin,exfoliates dead skin cells and helps to combat Acne.Oatmeal penetrates deep into the skin and nourishes skin from deep within,improving skin tone and texture. Clinically effective in healing dry and itchy skin.Suitable for all skin types. Rosmarinus Officinalis (Rosemary) Essential Oil Rosemary essential oil rehydrates and tones skin.The Oil removes wrinkles and bags on the skin, thus making it firmer and more elastic.